AAA has been around for over 100 years and helps people with insurance, banking, and loan needs. It serves almost four million members, throughout Maryland, Delaware, Pennsylvania, New Jersey, Virginia, and D.C. They have recently began offering a lot of services available online. Keystone Insurance Company is a subsidiary of AAA-Mid-Atlantic, Inc. In 2013, the Market Share and Competitive Satisfaction Report reported that AAA had the fastest average response time on injury claims. AAA Mid-Atlantic is a part of AAA National Federation (American Automobile Association). AAA is known for its emergency roadside assistance, but also offers home/auto insurance as well as financial services like home loans and credit to both members and non-members. AAA has more than 56 million members nationwide. Members of AAA Mid-Atlantic receive roadside assistance, identity theft monitoring, trip interruption expense reimbursement, bicycle coverage, and access to travel and local agents. AAA Mid-Atlantic also provides information about researching vehicles, discounts and rewards for hotels and restaurants, and public affairs information. Roadside assistance helps members when their vehicle is disabled while they are driving. This service includes towing for up to three miles. AAA also has a battery service that includes an assessment of a vehicle and a boosting or replacement service. AAA Mid-Atlantic releases reports regarding winter safety tips on local news channels as well as other publications. There are ten AAA Mid-Atlantic locations in Maryland - Annapolis, Gambrills, Brandywine, Columbia, Frederick, Gaithersburg, Glen Burnie, Rockville, Towson, and White Marsh. Additionally you can go to an AAA Service Center for State Inspections and to renew your vehicles tag and titles. You can report a claim at this telephone number: 800-207-3618. Below are some cases that have been filed recently against AAA Mid-Atlantic, accompanied by a short summary of the allegations when available. We took this out 13 years. The take home message we get from this list is that AAA is not letting many cases go to trial and they are certainly not letting large cases go to trial where there insured his significant exposure to a large verdict. In Maryland, if you file suit against AAA Mid-Atlantic, you are likely to see the Law Offices of Frank Daily in the Baltimore area and DeCaro Doran in our Washington suburbs. Both are good law firms. 2015, Virginia: $100,000 Settlement. Plaintiff is driving his vehicle at approximately 50 mph when he enters an intersection and defendant's vehicle collides with his. Plaintiff suffers blunt force trauma to his chest, resulting in collapsed lungs and the need for a pacemaker. He files a claim against the woman, alleging negligence in operating her vehicle. He also filed a claim against his insurance company, AAA Mid-Atlantic, to recover benefits under his underinsured motorist policy. The defendant offered her policy limits of $25,000 while AAA disputed the nature of any injuries. Plaintiff settled for the $25,000 policy limits of the defendant and agreed to settle with AAA for $75,000. 2013, New Jersey: $90,000 Settlement. A 36-year-old police officer is on duty. He conducts a vehicle stop on an entrance ramp, and is getting back into his patrol car when defendant's vehicle spins out of control and rear-ends the officer's cruiser. The police officer suffered a disc herniation as a result, which ends his career as a police officer. Defendant's insurance carrier, AAA Mid-Atlantic, agrees to settle the case for $90,000 the day trial was scheduled to begin. 2010, Pennsylvania: $9,250 Verdict. A 14-year-old boy is on his skateboard when defendant is driving her vehicle in the opposite direction on the same road. Defendant's side view mirror strikes the boy, flipping him onto her hood and then onto the ground. He sustains injuries to his medial collateral ligament and cruciate ligament in his right knee. He was placed in a leg cast for six weeks and needed physical therapy for months afterward. The boy alleges that the woman was driving too fast for the residential street, and the defense argued that the boy was on the wrong side of the street and the woman was unable to see him because of the setting sun. A jury found the boy to be 49% liable, and the defendant to be 51% at fault. They awarded the boy $9,250. 2008, New Jersey: $123,802 Verdict. A 48-year-old woman is injured in a car accident and is diagnosed with reflex sympathetic dystrophy (RSD) as a result. She seeks reimbursement of her medical costs through her automobile insurance policy with AAA Mid-Atlantic. AAA disagrees with the woman's diagnosis after having her examined with their own physician, and then terminates coverage. The woman sues AAA to compel coverage and to be reimbursed. A judge finds that she was not suffering from RSD and that the diagnosis was not causally related. However, the woman is in a second accident a few years later. She returns to the same doctor, who states that the second accident aggravated her pre-existing RSD condition. She seeks to have her medical expenses paid again through AAA, who once again, denies her claims. AAA relies on the same medical expert from the first case, and the matter goes to trial. The woman argues that she got RDS after the first accident and continued to suffer from it, and AAA argues that she never had RDS. A judge awards the woman $123,802 plus counsel fees of almost $20,000. 2008, Maryland: $32,940 Verdict. An adult woman is driving her vehicle when suddenly another vehicle traveling the opposite direction loses control and cuts her off, striking her vehicle. The woman files a UM/UIM claim with her insurer, AAA Mid-Atlantic and also against the other driver. She alleges that AAA breached their contract as they didn't pay UIM/UM coverage for the phantom vehicle that the defendant alleged cut her off, causing her to impact plaintiff's vehicle. A judge awarded the woman $22,180 for medical expenses, $760 for lost wages, and $10,000 for non-economic damages against the other driver and AAA. 2007, New York: $90,000 Settlement. Plaintiff is a passenger in a vehicle that was traveling through an intersection when defendant's vehicle, traveling on the cross street, collided with it. The woman sues the owner of the defendant's vehicle as well as the drivers, and alleges the operation of the vehicle was negligent. Both drivers argue that their respective traffic signal was green. The plaintiff allegedly suffers derangement of her intervertebral discs in her cervical spine. The driver of defendant's vehicle was insured by AAA Mid-Atlantic, who agreed to settle the case for $90,000 out of the $100,000 policy. 2004, Pennsylvania: $40,000 Settlement. A minor boy is riding his bike when he is struck by a car that is allegedly traveling outside of its lane. As a result, the boy sustains hip contusions and a fractured right ankle. The boy's mother brought a claim against the driver's insurance carrier, AAA Mid-Atlantic, who agreed to settle for $15,000, and against her underinsured motorist carrier, State Farm, who agreed to settle for $25,000. The total settlement was $40,000. 2003, New Jersey: $184,000 Settlement. A 19-year-old female is a passenger in a car being driven by the defendant. The defendant turns right, and turns into the path of a bus being operated by defendant Transit. The plaintiff argues that due to the bus drivers speed, the bus crashed into the left side of the vehicle she was riding in which caused the car to jump the curb and strike a building. The driver of the vehicle was killed, and the plaintiff sustained a left femur fracture, a fractured nose, and fractures to her left orbit, accompanied by a permanent loss of vision. The defendant's produce witnesses reporting that the vehicle's lights were not on at the time of the accident. At a trial to determine liability, 57.5% of the blame was assessed to be the fault of the plaintiff's driver, and 42.5% to be the fault of the bus driver and Transit Company. The parties then settled regarding damages, with the Transit paying $175,000 to the woman for pain and suffering and the driver's insurance carrier, AAA Mid-Atlantic, paying $9,000. 2002, Pennsylvania: $12,500 Settlement. A minor girl is attacked by a dog owned the defendant. She sustains a fracture of her distal right ulnar shaft and lacerations. Her parents file suit against the defendant, arguing he failed to properly secure his dog and seeking medical expenses and pain and suffering damages. The parties settled for $12,500. 2002, Pennsylvania: $25,000 Settlement. A minor female is a passenger in a vehicle when the vehicle is impacted by defendant driver who ran a red light. The minor girl sustained a left knee injury as a result, and her parents argue that the driver of the truck who ran the red light failed to properly operate the vehicle, and that the driver of the vehicle their daughter was in failed to keep a careful lookout for other vehicles. The parties agreed to settle for $25,000, paid by the defendant's insurance company AAA Mid-Atlantic. 2001, Massachusetts: $210,000 Settlement. An 18-year-old college student is riding her bike when she stops at a crosswalk before crossing a roadway. A taxi driver also stops, and then allows her to cross on her bicycle. As she was crossing, defendant driver, attempting to pass the taxi, strikes the girl. The student fractured her tibia, fibula, and pelvis and also sustained a left knee injury requiring immobilization. Defendant argued that the student was on her bike and therefore wasn't a pedestrian, but the insurance company, AAA Mid-Atlantic, settles the case for $210,000. 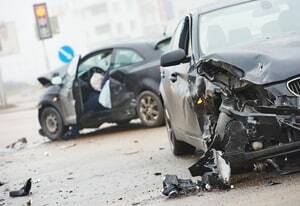 Miller and Zois has handled many car accident claims in Maryland and Washington, D.C. involving personal injury claims against this insurance company. If you have been hurt in a car accident and have questions about a claim or filing a lawsuit, please go online for a free evaluation or call us at 800-553-8082. Negotiating with insurance companies and similar information on every other major insurance company operating in Maryland and Washington, D.C.
Can you handle your car insurance case without a lawyer?